Asian Games 2018 Boxing: After a successful run at the Gold Coast Commonwealth Games, the Indian boxers are now gearing up for the next challenge, the Asian Games 2018, where they will take on the Asia's best. "Iron Chin", Gaurav Solanki is one of the top contenders for a podium finish in Jakarta. Here's a look at the top player's career. "Iron Chin", Gaurav Solanki is one of the top contenders for a podium finish in Jakarta. 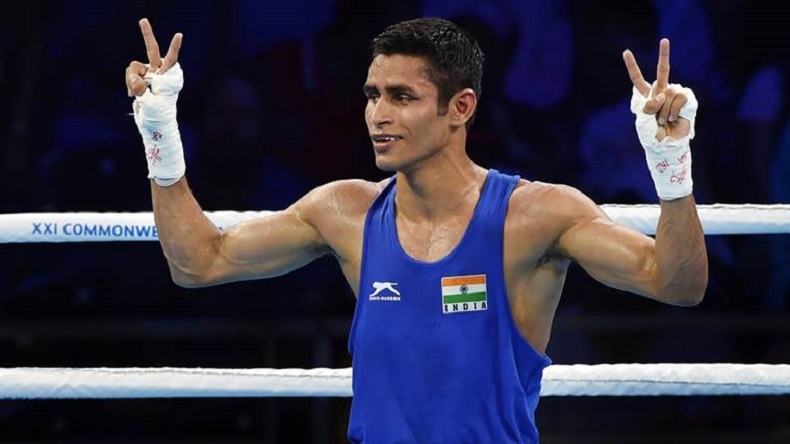 Commonwealth Games 2018 gold-medallist Gaurav Solanki is among the boxers selected for the upcoming Asian Games 2018 in Jakarta, Indonesia. The young boxer from Haryana hails from Ballabgarh where his father owns an electric shop. In the recently held Chemistry Cup in Germany, Solanki punched his way to Gold against the much experienced Cuba’s Alejandro Merencio, giving him a major boost for the Jakarta games. Solanki comes from a boxing family, his elder sister, Neelam was also a national level boxing champion from 2013 to 2015. However, it was not easy for him to chase his dream at a place where sporting culture is nowhere to be seen. Unline the boxing-crazy Bhiwani or the wrestling-mad Sonipat, Bhallawgad has no sporting leaning. Despite great odds, the young champ punched away the problems. Starting early, Gaurav drew first Gold blood in 2009, when he won at the 25th Junior National Boxing Championship. He went on to clinch Golds at Sub-Junior Men National Boxing Championships in 2011 and 2012. From there he’s never looked back. Solanki’s Commonwealth run has earned him the “Iron Chin” tag. He took on the Northern Ireland’s challenge Brendon Irvine and won by a split 4:1 verdict. The game was fast paced but the tactical brilliance and quick footwork made Solanki clinch the medal. Professional Highlights: Gaurav Solanki won Gold at the Gold Coast Commonwealth Games 2018 and then another top finish in the Chemistry Cup. Solanki has also won Gold at the prestigious Strandja International Boxing tournament.